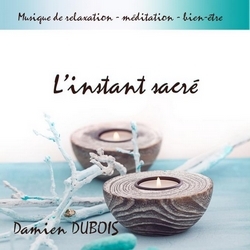 After the success of his previous album, winning a prestigious Hollywood Music Award in Los Angeles, Damien DUBOIS delights us again with his visionary and romantic style that unites the well-being and relaxation lovers worldwide. For over an hour, the pure, sumptuous and poetic compositions of this album invites the listener to relax and let go, to approach us closer to this "sacred moment" that leads to inner peace and serenity. An album especially suitable for massage, relaxation, dreams, and that is a unique emotional experience. We are happy to share its listening on Radio PLENITUDE, every day, from March 06, 2018 until April 01, 2018 inclusive before it enters a regular program.